Treating yourself to that special gift or bringing home something to remind you of your unforgettable holiday in Benalmadena is important and so here at MAC Hotels we thought we would lend you a helping hand and put together a list of authentic ideas from Benalmadena and the Malaga province. So take your inspiration from us and bring back something unique for yourself and for your loved ones. Commonly referred to as biznagas malagueñas these are basically handcrafted “flowers” of Jasmine that make a wonderful souvenir from Malaga with a gloriously fresh aroma that is a perfect reminder of sunshine and sea. Freshly picked Jasmine buds are skillfully attached onto previously picked and dried round thistles to seemingly magically bloom into beautiful , delicate balls of fresh Jasmine. Generally in summer, you will find these being sold on the streets, meaning all you have to worry about is getting them back home in one perfect piece. The first of many edible souvenirs on our list are the Tortas de Algarrobo, which are delicious biscuits made from special olive oil, almonds and aniseed. Named after the small village of Algarrobo in the Axaquia region, these biscuits are the perfect accompaniment to a morning coffee or ‘cuppa’ and are 100% “malagueño”. These scrumptious souvenirs can generally be found in most markets such as the famous Atarazanas Central Market, where you will no doubt find even more sweet and savoury delights to prolong the holiday. Ceramics are possibly the most purchased souvenir from Spain, and Malaga is no exception with its own particular unique style. Although inexpensive versions can be found in all souvenir shops in Benalmadena, why not check out Malaga’s high quality ceramics store ‘the Alfajar’ and pick up a complete set of stylish, brightly coloured bowls, ceramics or even tapas serving dishes and take a little (albeit fragile) part of Spanish culture home with you. 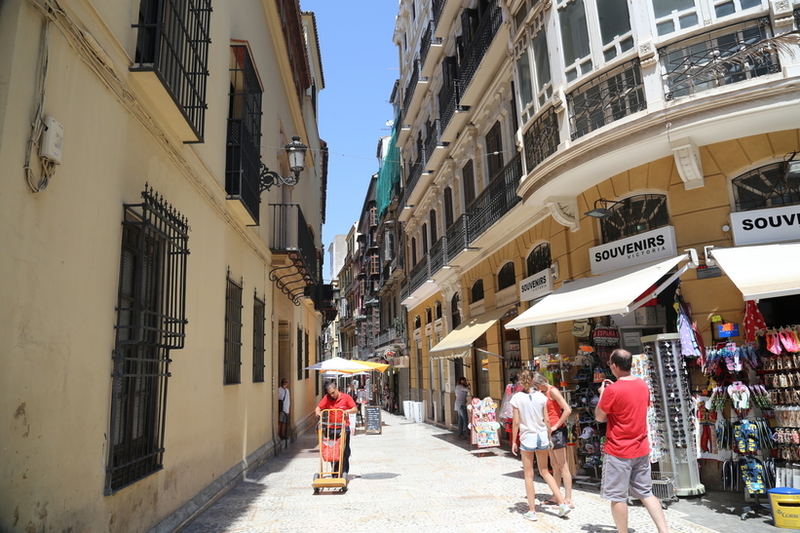 Picasso, the influential artist who is known for co-founding the Cubism movement also was born and raised in the centre of Malaga, where you will now find his very own museum, dedicated to his life. With this in mind, it seems like a good idea for fans of Picasso to treat themselves to one of the many Picasso-influenced souvenirs or prints, which you can find all over Benalmadena and the Malaga province. A bottle (or two) of wine is always one of the most appreciated souvenirs that fits nicely in your luggage and the many different types of traditional sweet wine from Malaga and the surrounding province are sure to be a success. These fortified wines are made from the Moscatel and Pedro Ximinez grape varieties and have been enjoyed throughout the ages, since the Phoenicians in the eighth century. You may need to be careful though since generally they have a deceptively high alcohol content but their delightful, sweet flavour makes them very ‘more-ish’. When on holiday in a country so famed for its olives it seemed our list wouldn’t be complete without including these Aloreña olives, which are the only olives in Spain with a designation of Origin. The whole cultivation process is 100% natural and takes place in the Guadalhorce valley, which is located just inland from Benalmadena and although they are used in many different recipes, the best way to try them is naturally seasoned and with a cold beer. Found in any good food market such as the famous Mercado de Salamanca, they will bring flooding back all the memories of your wonderful holiday at the MAC Puerto Marina hotel. Sugar cane honey is one of the lesser known products from Malaga and specifically from the pretty white town of Frigiliana, home of the only factory in Europe where it is produced in the traditional way and which is also the best place to purchase this sweet souvenir. This wonderful sweet syrup is essentially like molasses and has been being produced for nearly 3 centuries. You might even try it without knowing as it is commonly used in different local dishes since it is sweeter and healthier than white sugar. You can even come back and celebrate the day dedicated to the Miel de Cana in March, where you can visit the facilities and learn about the whole production process. A major part of Malagan cuisine, roasted almonds are found in a whole host of recipes, from typical sweets, ice cream, sauces that accompany meats and let’s not forget Ajoblanco – the traditional cold soup. Roasted in the ‘Alfarnate’ village style, they are prepared with the perfect amount of salt and can be purchased in small paper cones or “cartuchitos”. Find them at most small stalls scattered around the town and bring these little delights back to enjoy at home. This is easy to acquire since our wonderful 4-star MAC Puerto Marina Hotel is located right on the beach in front of the Puerto Marina in Benalmadena or alternatively you can explore some of the best beaches in Benalmadena and take advantage of that wonderful Spanish sun, top up your tan and arrive home that golden colour that will make all your friends jealous. Although there are plenty of wonderful shops, markets and boutiques, which are great for shopping in Benalmadena, including many places to find your perfect souvenir or gift, it is also true that not all the best souvenirs can be manufactured and bought. So enjoy your holiday in Benalmadena and take home something far more special, in the form travel, spending time with friends, family and loved ones and creating the fondest of memories that can never be lost, broken or used up.